The program for 1956 retains the white cover with wing and wheel logo and flags and is the same size as the 1955 at 8 1/2" x 11". This same size and basic format remains the same through 1975. The price remains 50 cents through 1963 but raises to 75 cents for 1964 and 1965. 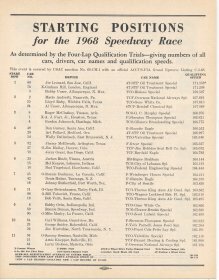 In 1966 the price raises to $1 and stays so through 1974 with the 1975 program raised to $2. 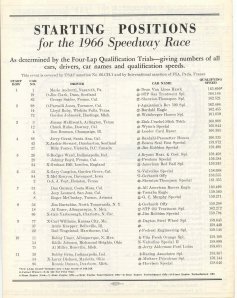 There are pages numbers for all programs from 1956 through 1975. The insert retains the same size and basic format as that of 1955 and does so through 1966. For 1967 through 1975, the size and basic format are retained, but a row by row driver biography is added to the inside. Where there is a variation in printing of the insert, there will be a picture. 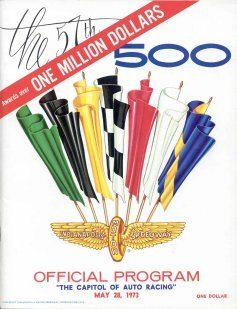 To honor the 50th Anniversary of the Speedway, the cover changes to a gold color, but still retains the wing and wheel with flags logo. 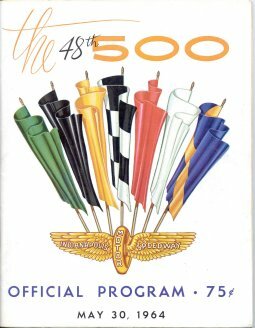 The programs pick up in 1962 with the same design as 1955-60. In 1964, there are two different versions of the cover. One has the price of 75 cents at lower right, while on the other it is deleted. Examples have been found from 1965 through 1970 with 1965 and 1966 shown below. If you have one from a year not listed, email a scan to us and it will be posted. It is believed that those programs with out the prices listed on the cover were sold where the closed circuit TV broadcast was shown. 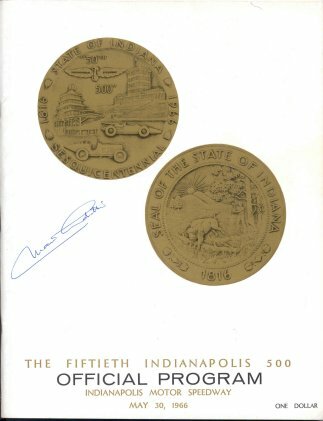 The State of Indiana celebrated it's 150th Anniversary and it was also the 50th running of the ‘500’ in 1966 so a coin was issued which is represented on the cover of the program. The writing changes at the bottom of the program for 1966 through 1970, and other than the coins on the cover of the 1966, the same basic format remains. For 1971 and 1972, a blue diagonal stripe is added at the top left with the words "Awards over One Million Dollars" in yellow added to it. The words "The Capitol Of Auto Racing" have been added in red at the bottom of the program. The script writing at top left denoting the 55th running (for 1971) is now all black and the "500" is red. 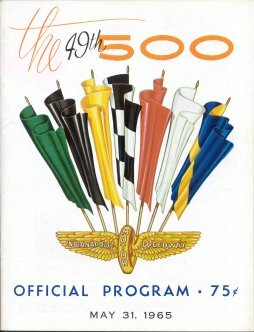 “Official Program”, the date and the price are in blue. Marlboro was the series sponsor in 1971 ONLY and their logo appears at bottom left. The Marlboro logo is replaced by Speedway copyright information for 1972 through 1975. 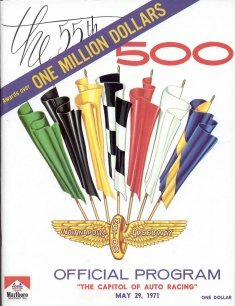 For 1973 through 1975, the stripe at top left is now red and "Awards over One Million Dollars" are white, the "500" at top right is now a dark blue as is "The Capitol Of Auto Racing" at bottom. "Official Program", the date and price change to red. Programs from the 1956-1975 era are much easier to find the further up you go. If one had to choose which ones are tougher to find in excellent condition, they would be 1960 and the 1973 with the race day line up insert. 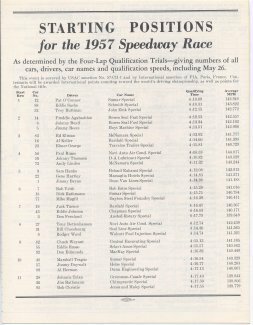 It is relatively easy to find a 1973 program as many were sold during the month of May, but finding a race day line up insert that hasn't been damaged after three days of rain is getting tougher to find. The 1967 race was halted by rain and completed the next day so program inserts not damaged by rain may be a little tougher to find in excellent condition. The 1967 and 1969 programs may be tough to find due to the two page color ad for the Camaro Pace Car at the center of each program.